The boyfriend brought over 18 pounds of squash this last week. (Yes, I weighed it.) I hadn’t quite made it through the last squash gift so it became sort of important to find a way not to be buried under summer deliciousness. I added two pattypans to my favourite Eggplant Curry. I made Zucchini Fries out of two long yellow zucchini. And I made squash fritters out of the Lebanese White Bush squash. Then there are the muffin recipes I made with previous squash deliveries: Wholesome Zucchini Muffins (much tastier than the name implies) and Nonfat Chocolate Zucchini Muffins (in which I discovered that I like my chocolate and my zucchini separate, but everyone else in the world loves these so it’s a great way to make other people happy while getting rid of squash). The Boyfriend’s favorite method involves marinating long wedges of squash in different flavoured and balsalmic vinegars, olive oil, dried herbs, and garlic powder, then either grilling or sautéing depending on what method is available. Unstoppably delicious. Since “Sneak Zucchini Onto Your Neighbor’s Porch Day” has recently passed, I hope everyone has more than enough summer squash to keep them happy. 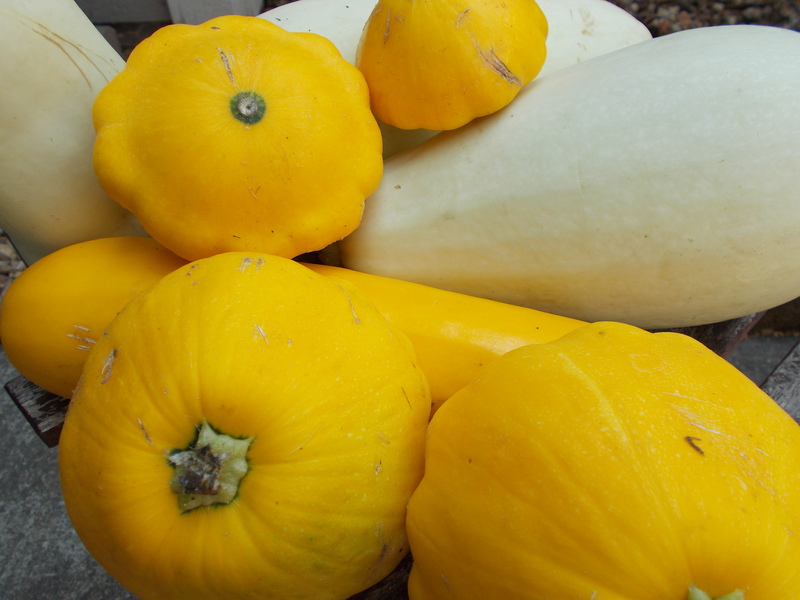 What’s your favorite way to handle a squash glut? This entry was posted in Questions and tagged Coming out of my ears, The beauty of seasons, Tips and tricks by Rommie. Bookmark the permalink.